I'd fiddled with this in six but not shown anyone. Been doing more reskinning than breeding Here is what I changed. Nostrils bigger/darker textures to more look how they flare when running. Mane/tail textured with some brown and more highlights. On the black it just looks like a little sun bleaching but helps fool the eye on the browns, making the dark brown look decent and the chestnut slightly less odd. Eye texture found, some tweaks to make them look reflective, light lashes look on two. 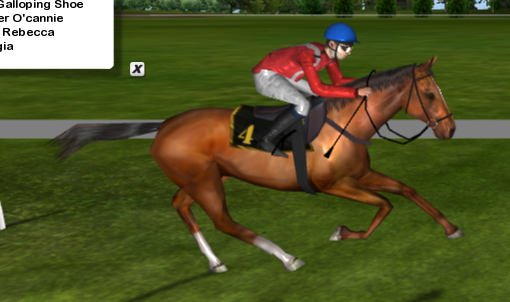 Can only notice eye changes if in jockey mode and looking around. Too many blazes, fewer other markings, so varied the face markings. Looked like too many socks, but some were bandages. Changed some to have fasteners or a contrasting tape color to make it more obvious what was a sock and what was a boot/bandage. More variation in sock heights. ... Now: faded blaze removed, minor tweaks only. ... Now: is a sooty dappled bay with a star and hind leg wrap bandages changed to black boots with contrasting white closures. Of course no help without pictures. This field, happily, had at least one of every color entered. (Pics also show mjtags11 saddle cloth number colorizer). If anyone wants to test them as well, or cares to try them let me know. Last edited by Hechicera on Tue Feb 12, 2019 1:13 am, edited 2 times in total. Get them out they look good, i'd have them in my game. I played with the horse textures myself back early in SO6 and found the eyes are part of the bridle texture. Once I noticed that, it started to kill my desire to tweak the textures any. I wanted some horses with white bridles, some with red, others with black or brown. Having the bridles look like they have polka dots due to keeping the horse's color brown or having the reverse with the horses looking blind or really odd stopped me from changing them. 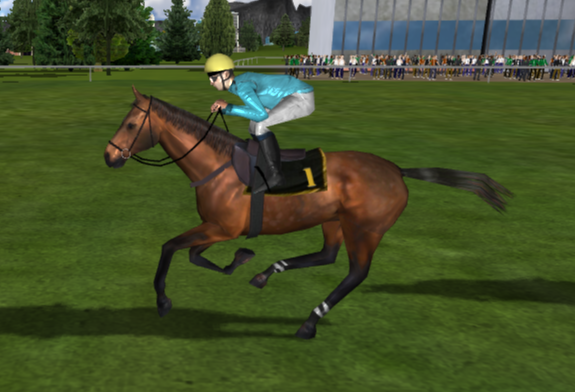 Then I had hoped we could have multiple textures for the same color so two bay 2 horses would have different markings but that was impossible, too. The single mane and tail file was another one that discouraged me. The mirrored and repeating textures (most obvious with the bridle) drove me bonkers. 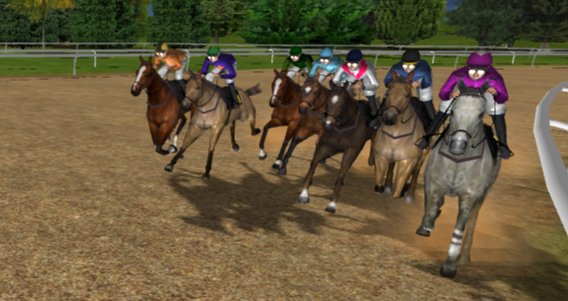 I eventually gave up after the only horse I really semi-completed was California Chrome. When I couldn't make him a true chestnut without making the other colors look strange, I threw in the towel. 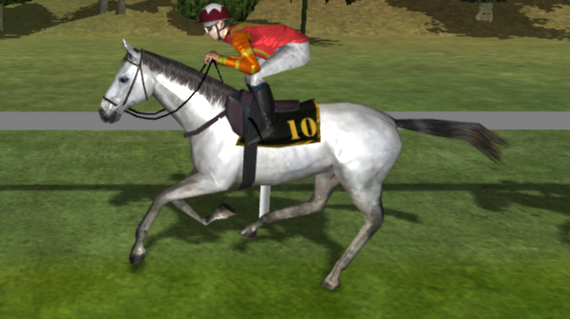 Your textures look good, but it'd be nice if the tack were a separate file so we could have different colored tack, that there were multiple mane/tail files so we could have true chestnuts (regardless if you have the color in there, they're still considered bays in the game) and even white grey ones if we wanted, and each color had multiple skins. I could have sworn a feature of SO7 was a mod folder so we didn't have to replace files or have to keep replacing files after patches. So far I haven't seen hide nor hair of that. Maybe that's still in the pipeline, it's there and I missed it, or I was just dreaming it. Gets rather repetitive debating how much I want to patch the game versus how many files I have to replace after the patch and then hoping I don't forget anything causing the game to crash. Spending weeks editing the showcase only to do an update and my entire showcase gets wiped out forcing me to have to go back to replace files with my versions gets irritating. If the mod folder is a real thing and still intended, maybe multiple skins for the same color will be possible this time, though. Yeah, the file layout is the same. I found what you found, and even more weirdness. Then documented it all for Mark in my non-critical bug list I'm maintaining of what I've found so far over here http://www.startersorders.com/phpBB2/viewtopic.php?f=32&t=17667 Over the weekend I sorted it by type of bug, so I have a whole page on 3D ones about three posts down. I used red to isolate the pixels, and the link to the black with glowing red eyes and red striped bridle is funny. The visor bug is also is amusing. Let me know if you have problems with the link or the files. Last edited by Hechicera on Tue Jan 15, 2019 7:35 pm, edited 1 time in total. I just increased the sharing level. Then retried in two different browsers, and while signed out of google. I also added the link in the post above for a specific ....../view. Try that one in case the default was for edit. Both the icon and button worked for me (even with the preview warning). If they don't can you explain what you do see instead? I was hoping to use google share rather than a paid service. Whew, excellent. Just got to the computer after sleeping in from feeling under the weather. So this is my first good news of the morning, err afternoon. They look great. Good work! Shergar - unstoppable and always the best. Thanks, new version up. 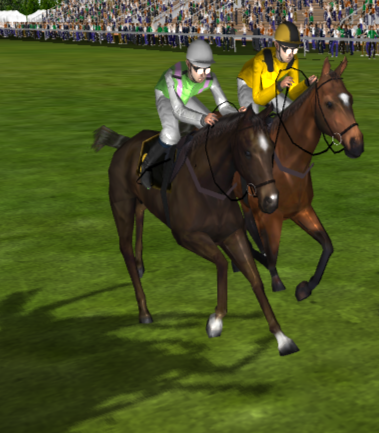 Two changes you can see watching, one you would really only notice in jockey mode and looking around (back). To get new versions, should be able to just redownload from same links. What I'm working on. These aren't out yet. The base skins had few muscle shadows, just structural ones. I've added a flank muscle as when running it really pops when fit and on some colors that flank muscle is obvious (Winx is a good example on both fit and color that shows it heavily). I've also added either a darker dorsal stripe (browns usually and dark bays often have one) or lighter shading (coat color depending) along the spine. 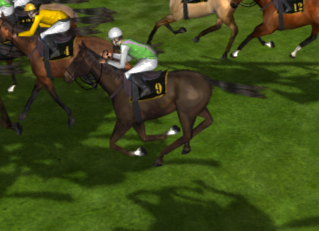 When viewed from above is more interesting and from an angle, shading of the spine on the hindquarters helps give an impression of the shadow cast by the back muscles present in a racing fit horse regardless of markings. I've also had difficulty trying to get the chest muscles to show and then to get a blend with the neck, and with further refinements in the face shading. I am mostly satisfied with Brown (also added more seal points to it for more interest), and in progress on the two greys and black. Once I've done a pass on all, I'll release the set as the next version I guess. This is why I haven't done more breeding! 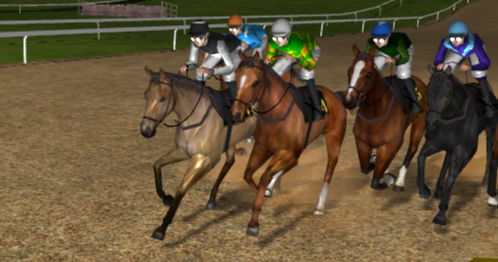 The front angle, from jockey mode, using z or x to look back at the horse. Shows flank muscle, work on hindquarter shading. The spine dorsal stripe/shadow on Brown, form an above angle. This will be the darkest one. Some may not be full length on other colors, more where muscle is deeper. OK, the "no more grass belly on racing horses" version is up. Same download links. This will be most obvious if you ride in jockey mode a lot. No more grass belly! Shoulder, hip point, angle of hip, pants muscle shadow, neck muscle and leg joins all retouched on every color. Head shadows also looked at. Not perfect yet, but if I go down that rabbit hole ... though if anyone sees something that bugs them, let me know.